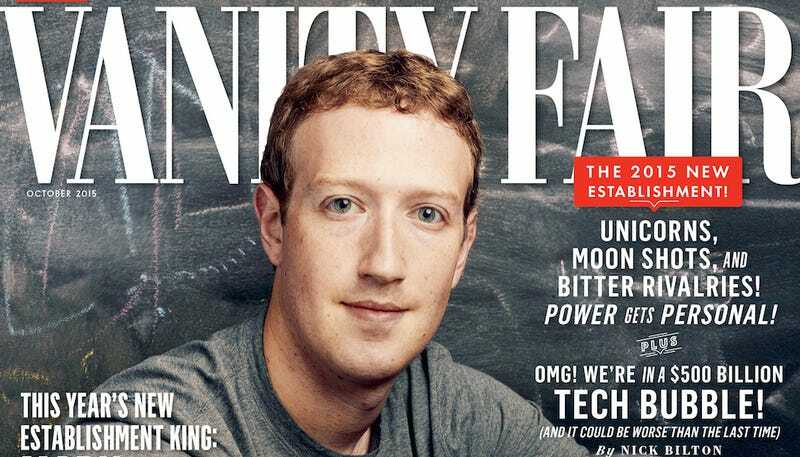 Mark Zuckerberg's Fashionisto Vanity Fair Cover: Get the Look! Filed to: Get the Look!Filed to: Get the Look! As we ease into September and yet another New York Fashion Week, Vanity Fair has unveiled its latest cover, this one featuring none other than Mark Zuckerberg, CEO and entrepreneur and, more importantly, Style Icon. Vanity Fair has christened Zuckerberg its “New Establishment King” as an “innovator” who has “defined the year” with his efforts towards making Facebook our entrée into the actual Matrix and conquering the internet as we know it until we need his corporation as urgently as our very lifeblood. But far more interesting is how his fashion sense embodies the taste of a new generation, a generation unbothered by options. “If the outfit worked yesterday,” teen boy icon Jaden Smith told CR Fashion Book, “wear it again today.” As Zuckerberg seeks to turn Facebook into the world’s one-stop shop for news and culture, so his personal style is its own one-stop shop, representing the future he wishes for us all. That future is exactly Facebook’s color scheme: grays, blues. Get the look!